Born in Middleton, Massachusetts, in 1824, Charles L. Flint worked his way through Harvard, graduating in 1849, taught for a short time, then returned to Harvard in 1850 to enter the Law School. In 1853, he left his law practice to become secretary of the newly formed Massachusetts Board of Agriculture, remaining in that position for 27 years. He had a part in the founding of the Massachusetts Institute of Technology, was a member of the Boston School Committee, and as one of the founders of the Massachusetts Agricultural College, he served as secretary of the Board of Trustees for 22 years. 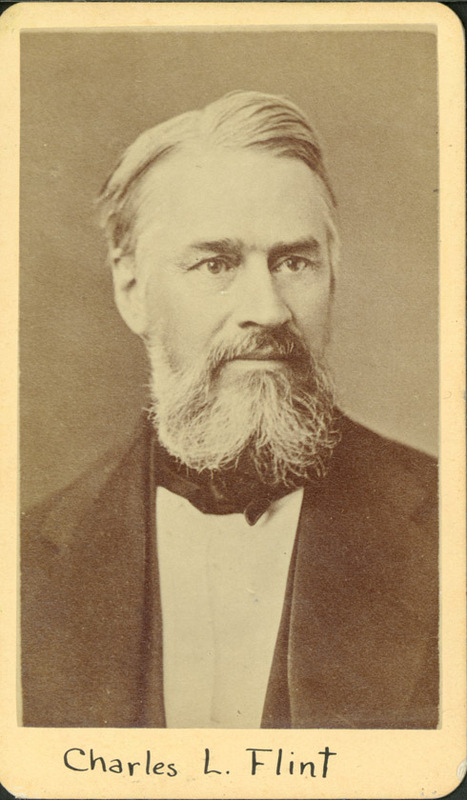 Selected during a budgetary crisis, Charles L. Flint agreed to serve as President of Massachusetts Agricultural College without a salary. For four years he gave lectures at the college on dairy farming. Upon the resignation of President William Smith Clark in 1879, Flint was elected President, though he served only until the spring of 1880. The Flint collection contains an assortment of photographs; reports as Secretary of the Massachusetts Board of Agriculture, 1854-1881; and printed versions of published writings.